Background: During conflict situations and war, penetrating cardiac injury (PCI) is a universally life threatening condition with a low survivability rate. A large majority of victims do not make it to the hospital and expire at the scene. Those that do survive are often in extremis and shock upon arrival to the hospital. These traumatic injuries require rapid intervention and aggressive patient stabilization. Early operative intervention is the key element to survival. Methods: We retrospectively describe 11 patients with PCI in two low resource field hospitals in Aleppo during the Syrian War over an 18-month period from December 2013 through May 2015. Data was collected retrospectively from patient records as well as available documents and diagnostic studies. Inclusion criteria were all patients with penetrating cardiac injury who arrived to the emergency department, were resuscitated, and subsequently taken to the operating theater. Results: Syrian surgeons were optimally aided by diagnostic bedside FAST ultrasonography. Ten of eleven patients described in our series survived with life-saving operative interventions featuring thoracotomies, rapid bleeding source identification and repair, with postoperative surgical intensive care monitoring. Conclusions: Training out of necessity and intense field experience for general surgeons during the Syrian war proved effective in rescuing patients with PCI who may have otherwise not survived. Penetrating cardiac injuries (PCI) are one of the most challenging presentations for a trauma surgeon due to a high mortality rate, a short therapeutic window, and the need for immediate potentially life-saving surgical interventions [1-3]. A large majority of victims do not make it to the hospital and expire at the scene. Those that do survive are often in extremis and shock upon arrival to the hospital. The current in the war in Syria is even more complicated to inadequate staffing and equipment, hospitals under military attack, a lack of trauma and cardiothoracic experience for most general surgeons, compounded by the sheer number of casualties the conflict has produced. To our knowledge, no studies exist focusing on penetrating cardiac injuries during the recent Syrian War. The purpose of this descriptive case series is to highlight the need for rapid diagnosis and emergent surgical intervention in penetrating cardiac victims. The importance of trauma surgery training in conflict settings is also discussed. We report a case series describing 11 patients with PCI treated at two low resource field hospitals in Aleppo over an 18-month period during the Syrian War from December 2013 through May 2015. Data was collected retrospectively from patient records as well as available documents and diagnostic studies. We limited our study to penetrating chest wounds that lead to direct cardiac injury. Inclusion criteria were all patients with penetrating cardiac injury with or without concomitant traumatic injury elsewhere on the body who arrived to the hospital emergency department, and were subsequently taken to the operating theater. We excluded patients who were “dead on arrival” (DOA) due to insufficient documentation. We documented patient vital signs and signs of life (SOL*) on presentation, key physical findings, diagnostic investigations (e.g., Focused Assessment Sonography for Trauma (FAST) and chest radiography), emergent operative cardiothoracic surgical procedures, length of stay in the surgical intensive care unit and surgical ward, final diagnosis, disposition, and patient outcome. *SOL includes: spontaneous eye movement, pupillary response, breathing, cardiac activity, and spontaneous movement . All patients were male, with a mean age of 31 years (ranged 19-48 years). The maximum time from injury at the scene to the emergency department was twenty minutes. The cause of penetrating chest wounds in all 11 patients was either secondary to high velocity shrapnel from explosions (9 patients) or gunshot wounds (2 patients). Seven out of the eleven patients (63%) arrived to the hospital with signs of life (SOL), three were in shock with hypotension and tachycardia (27%) and one patient presented with normal vital signs. Beck’s triad, (distended neck veins, muffled heart sounds and pulsus paradoxicus), indicative of pericardial tamponade, was described in three patients (27%). We were unable to accurately estimate the amount of blood loss and blood products for transfusion were extremely limited. All patients received aggressive crystalloid fluid resuscitation. 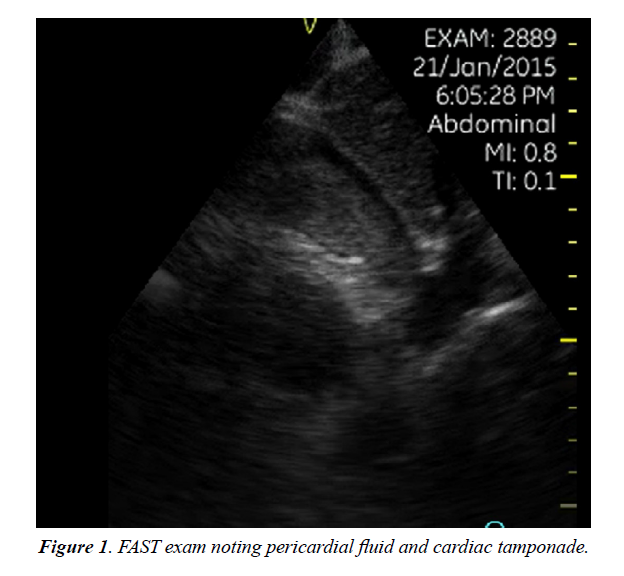 A portable, hand-held FAST ultrasound examination was performed on five patients and pericardial tamponade was rapidly detected in four of the cases with 80% sensitivity (Figure 1). 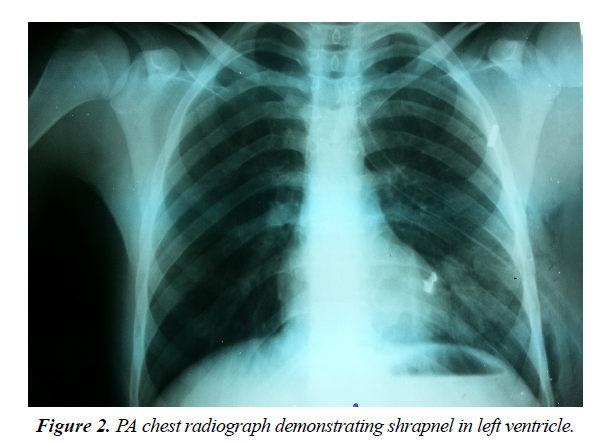 Chest radiographs were obtained for three patients with minimal diagnostic significance other than general shrapnel location (Figures 2 and 3). Figure 1: FAST exam noting pericardial fluid and cardiac tamponade. Figure 2: PA chest radiograph demonstrating shrapnel in left ventricle. 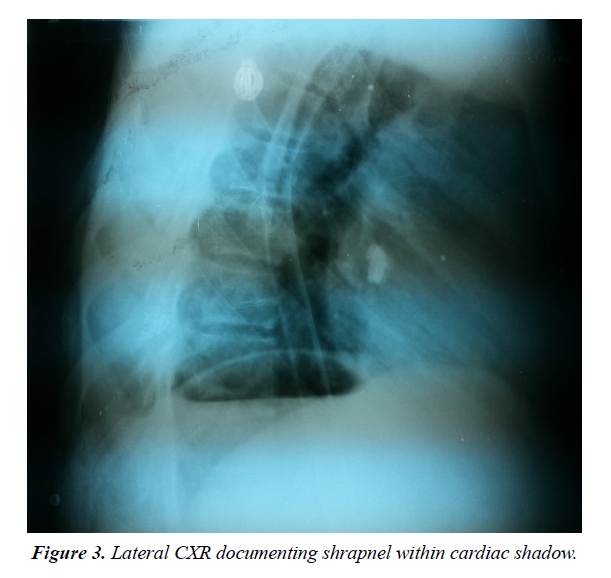 Figure 3: Lateral CXR documenting shrapnel within cardiac shadow. Six patients were immediately taken to the operating room, four during the first hour of hospital arrival, and one patient six hours after presentation. All patients underwent bilateral thoracotomy with an emergent clamshell-type incision due to concerns of contralateral hemithoracic injuries or associated thoracoabdominal injuries. After opening the chest, pericardial bleeding was discovered. When the pericardium was opened, clotted blood was evacuated and bleeding sites were controlled with direct pressure. The sites of cardiac injury included the right ventricle (n=4), left ventricle (n=3), atrium (2), coronary artery (1), and ascending aorta (1). Only three patients had other injuries in the chest cavity, one diaphragmatic, and the other two in the left lung. The cardiac injuries were repaired with prolene sutures reinforced with polytetrafluoroethylene (PTFE) pledgets. Three patients suffered cardiac arrhythmias (ventricular tachycardia) and were treated with cardioversion using internal paddles. One patient suffered a fatal cardiac arrest. The average length of stay in hospital was four days which included time in the surgical intensive care unit and general surgical ward. Three patients were transferred to an outside facility across the Syrian border to Turkey for more advanced surgical care. We followed up on 10 of 11 patients postoperatively until suture removal. Of the three patients transferred across the border, two recovered completely without complications and with one had missing follow-up data following transfer. Our overall mortality rate was 9%. All eleven cases are listed in Table 1 with detailed clinical, diagnostic, and disposition descriptions. Table 1. Case descriptions of eleven penetrating cardiac injuries. Cardiovascular injury advances have been made in times of war . Lessons learned from these experiences should be studied to avoid costly mistakes and enhance life-saving resuscitative measures . Documentation and careful record keeping such as the Vietnam Vascular Registry are vital to educate surgeons in future conflicts. The lessons learned from these registries have been carried on to other war and trauma settings with the establishment of the Global War on Terror Vascular Initiative . Cardiac injuries remain among the most challenging of all injuries in the field of trauma surgery. Their management often requires immediate operative intervention, advanced surgical techniques, and the ability to provide critical care monitoring to these patients postoperatively . Penetrating cardiac injury (PCI) is a universally life threatening condition if untreated, particularly in settings of conflict associated with mass casualties. Most patients die at the scene or in route to the hospital. In our case series, we excluded patients who were “dead on arrival” (DOA) due to insufficient documentation and inability to perform autopsies due to the high patient volume. In a study from southern Iran, the investigators noted that 11% of patients with penetrating cardiac injuries were “dead on arrival” . Regarding vital signs, they documented that 67% of patients with PCI were hypotensive and 22% were normotensive. Only 1 of our eleven patients was noted to be normotensive. Patients with PCI arriving to the emergency department may present in shock with pericardial tamponade which restricts contractility and cardiac output. The diagnosis is largely clinical, and emergency physicians and trauma surgeons must have high index of suspicion. Treatment must be prompt and decisive as there is limited opportunity to perform timeconsuming diagnostic investigations. Unless the patient has concomitant traumatic injuries with exsanguination, a large majority of patients with isolated penetrating cardiac injuries die from cardiac tamponade rather than hemorrhagic shock due to acute blood loss. Treatment often requires immediate surgical intervention with postoperative intensive critical care management. Since penetrating cardiac injuries can cause significant mortality, many experts recommend immediate thoracotomy for inspection of the heart and control of the bleeding site. Thoracotomy, whether done in the emergency department or in the operating theater, is necessary to completely assess the severity of penetrating wounds to the heart . In a recent Scandinavian study, immediate Emergency Department thoracotomy (EDT) was performed for the following indications: patients with no signs of life (SOL) on admission who had demonstrated SOL during transport or at the scene, and exsanguinating patients without immediate response to aggressive fluid resuscitation . They concluded that the outcome of patients with penetrating cardiac injury reaching the emergency department with signs of life was “excellent” and hemodynamic instability indicated need for immediate surgery. However, cardiac arrest more than 10 minutes away from their trauma center indicated a poor prognosis. Stable patients with penetrating thoracic trauma and possible cardiac injury detected by FAST imaging were given more conservative management with observation in the surgical intensive care unit and frequent reimaging. In our experience during the Syrian conflict, many casualties presenting with PCI to our institutions during the first two years of the war expired due to lack of coordinated trauma and cardiothoracic (CT) surgical availability and insufficient hospital resources. As the war progressed, Syrian general surgeons were trained to deal with such cardiothoracic cases out of necessity, due to the lack of qualified and formally trained trauma or thoracic surgeons. To our knowledge, there have been no published data in the medical literature describing PCI during the recent war in Syria. The most common penetrating cardiac injuries in developed countries such as the United States and United Kingdom are from single gunshot wounds (GWS) or low velocity trauma from stabbings. During a military conflict, high-velocity injuries, including wounds from assault rifles and fragment or shrapnel injuries from bombs or explosive devices (IED) are much more common. In a study from a field hospital in southern Iraq, the authors reported that the major cause of missile injuries were from improvised explosive devices employed against both military and civilian targets. The insurgency in Iraq has ushered in the evolution of modern, low-intensity, and urban setting conflicts . The effectiveness of aggressive resuscitation and early surgical intervention was evaluated in 1,992 casualties with thoracic battle wounds in Lebanon. The mechanism of injury was mainly high-velocity missiles and shelling in city battles. Ninety-seven percent of the wounds were penetrating. For 285 casualties with cardiac injuries, (14% incidence), the overall survival was 73%. Survival was best for those with pericardial and coronary vessel wounds and dropped to 46% for those with left ventricular injuries. Survival was 87% among 54 patients with great vessel wounds. Life salvage in 726 (36%) patients was documented to result from early open procedures . Over a 6-month period in Baghdad, Iraq a US Army study reported a retrospective review of 11 war-related cases with high-velocity injury and suspected myocardial involvement. All eleven cases survived to admission (5 GSW, 6 IED). Like our study in Syria, all patients were younger males with a mean age of 27 years. Eight of the 11 patients were victims of multiple traumatic injuries. The cardiac entrance wound involved the right ventricle (n=3), right atrium (2), left ventricle (1), mediastinum and pericardial reflections (5). Bedside echocardiography was performed in all 11 patients. In 7 patients, no foreign body was identifiable, and in 2 patients the foreign body was identified in the pericardial fat pad. Three patients were identified has having a suspected ventricular septal defect. In their study, the most common electrocardiographic abnormality was an atrioventricular block and right bundle branch block. In 4 patients, the management of the chest injury was nonsurgical, and in one patient the treatment was limited to an insertion of a chest tube only. Four of the patients underwent median sternotomy, one underwent emergent lateral thoracotomy, and one underwent an infra-diaphragmatic approach. The authors concluded that high-velocity wound chest injuries with potential cardiac involvement may allow selective non-operative management with a multidisciplinary approach . The anatomic position of the heart within the thorax determines to some degree the injury encountered. The right and left ventricles are each injured approximately 40% of the time. The frequency of the right atrial injury is 24% and left atrial injury 3% . In our series, we had more ventricular involvement with 4 patients having right ventricular injuries (36%), 3 left ventricular (27%), and one each to the right atria and left atria. In the study from southern Iran , paired sample test showed significant correlation between mortality and electrocardiogram changes, the amount of retained blood in the pericardium and the physiologic condition at presentation. In a case report describing a patient with a penetrating cardiac injury, the authors advocate for urgent, but not emergent thoracotomy. The patient described was found to be clinically stable upon presentation, and the FAST exam revealed a large pericardial effusion suspicious for cardiac injury. The report supports delayed thoracotomy as “safe” avoiding the morbidity and unnecessary “dangers” incumbent in emergency department thoracotomy . In our case series of 11, only one patient met their criteria for having stable vital signs on presentation. In a report of civilian trauma in the 1980s, of 34 patients who had penetrating cardiac injury and less than 4 minutes of prehospital cardiac arrest prior to arrival to the ED, survival was 64.7% . A large South African study investigated nonmilitary penetrating thoracic trauma in a metropolitan surgical service over a 3-year period. The investigators treated a total of 1186 patients, with 124 gunshot wounds and 1062 stab wounds. Most of their patients with penetrating chest trauma reached the hospital within 60 minutes. In our study, patients arrived in a maximum time of 20 minutes. They noted that less than a quarter of patient with penetrating cardiac injury reached the hospital alive. In their study, surgical access was via median sternotomy in 56 patients and lateral thoracotomy in 52. Gunshot wounds of the thorax were more lethal than stab wounds (52% versus 30%). Of those who were operated on, they documented a 90% survival rate further reinforcing the need from prompt and decisive surgical intervention with penetrating chest wounds manifesting with cardiac injury [8,14]. In a recent urban investigation from India, out of 21 cases of PCI, 6 (29%) had isolated and 15 (71%) had other associated traumatic injuries. The ratio between blunt and penetrating injuries was 2:1 with a male preponderance. Overall, 19 of their patients underwent surgery. Perioperatively, 8 (38%) developed cardiac arrest and 7 developed cardiac arrhythmia. Overall their survival rate was 71% . They concluded that emergency thoracotomy for acute traumatic pericardial tamponade and repair of underlying cardiac injury by a trauma surgeon could improve the survival rate. They particularly noted that cardiac arrhythmias need to be promptly addressed, as they were significantly related to mortality in survivors of PCI. In a study of penetrating cardiac injuries in Tunisia, as with our study, the mean age of patients was 25 years. Unlike our patient series, their patients had cardiac injury resulting from stab wounds inside the pericardium. 42% were critically unstable, and 21% had pericardial tamponade. The authors advocated for a “scoop and go” mentality as an absolute principle in the prehospital setting when dealing with penetrating cardiac injuries. Only 4% of patients arresting in the ambulance survived, but 74% of the patients who arrived to the OR and underwent thoracotomy survived. Of note, all their patients were rapidly transferred to the OR without any other diagnostic investigations since these types of injuries are ominous and require rapid response . Regarding imaging of high-velocity penetrating chest wounds with cardiac injuries, one study commented that a simple chest radiograph was unable to discern the location of the projectiles. In contrast, computed tomography (CT) scanning was better able to identify both the number of projectiles and their location. In our low resource hospital settings in Syria, we had little to no access to diagnostic CT scans . The study from Tunisia also agreed that chest radiographs were of limited value in the initial assessment of the patients with PCI. The cardiac silhouette was not enlarged in up to 80% of patients with acute cardiac tamponade . At least 250 ml of pericardial fluid or blood is needed to detect cardiac enlargement radio graphically. An electrocardiogram (ECG) may suggest tamponade if the QRS voltage is decreased or if the dominant QRS axis consistently changes (electrical alterans). However, a normal ECG does not rule-out a penetrating cardiac injury. As per the previously discussed Scandinavian investigation , Focused Assessment with Sonography in Trauma (FAST) should be a routine part of the initial assessment. Another investigation looking at the utility of the (FAST) in penetrating torso trauma found the prevalence of a positive exam after penetrating trauma was ranged from 24%-56%. They noted that the FAST exam for penetrating trauma is a highly specific (94%- 100%), but not a very sensitive diagnostic modality . In the afore-mentioned trial from India , the diagnostic accuracy of focused assessment by FAST in PCI was 95%. Another study found the routine use of sonography in penetrating torso injury was clinically beneficial for the detection of pericardial or peritoneal fluid. However, they caution that a negative FAST examination does not exclude injury, particularly a diaphragmatic or hollow viscus wound . Regarding the cost-effectiveness of the cardiac component of the FAST exam, the incremental cost-effectiveness ratio was favorable for hypotensive patients but not normotensive patients. However, it is important to note that this investigation focused on blunt cardiac trauma, not penetrating trauma, as with our Syrian case series . The choice of incision may be influenced by the surgeon’s experience. While a posterolateral thoracotomy affords adequate exposure of the pleural cavity, it allows only limited cardiac exposure. Another disadvantage is that it may cause hemodynamic instability since the lateral decubitus position can exacerbate hypotension. A median sternotomy affords optimal mediastinal exposure and it can be performed rapidly and allowing repair of cardiac injuries. While cardiothoracic and trauma surgeons have more experience with this approach, a well-trained general surgeon should be to utilize this technique to manage patients with PCI. In the study from Tunisia, a left anterolateral thoracotomy was the most commonly used approach . In our series, following a standard left anterolateral thoracotomy, due to concerns of contralateral right thoracic or associated thoracoabdominal injuries, we extended this incision into a clamshell or transverse sternotomy made by performing a symmetrical right sided thoracotomy in the same intercostal space. Using a rib retractor, the sternum was fully elevated providing excellent exposure to the heart, lungs, great vessels, and both thoracic cavities . This technique also allows cardiac massage and internal defibrillation if needed. Once the mediastinum has been exposed, the pericardium should be opened and evacuated if in tamponade. The suggested standard approach is a subxyphoid pericardial window . Regarding the direct cardiac injury, several techniques are available to achieve temporary control of the cardiac injury including digital control, placement of a Foley catheter and the use of skin staples. We favor rapid digital control since it is a simple and direct method. For suturing, we prefer 2 or 3-0 prolene Halsted mattress stitches along with polytetrafluoroethylene (PTFE) pledgets, when available, or using pledgets directly from the pericardium. A study documenting surgical workload from an integrated United Kingdom field hospital during the 2003 Gulf War conflict described a consultant led, multidisciplinary approach with field intensive care facilities. This combined approach allowed staged and safe surgery for complex, multi-organ trauma (including thoracic) in an austere environment. Unlike our experience in Syria, their general surgeons had accessible integration with on-site multiple specialists including trauma and cardiothoracic surgery . In describing skill sets and competencies for the modern military surgeon, a British military operations experience in Southern Afghanistan concluded that a 6-week deployment provided and equivalent exposure to penetrating trauma as a 3-year experience in the typical UK surgical training program. They noted that the spectrum of injuries seen and the requisite skill set that the military surgeon must possess is outside that usual training curriculum. Several different strategies, including the deployment of trainee specialists to combat hospitals, with more focused pre-deployment military trauma surgery training courses, and wet-laboratory or simulation exercises are needed to prepare future generations of surgeons operating in war-torn conflict environments . This is a small descriptive retrospective case series describing penetrating cardiac injuries during the Syrian conflict. The two hospitals involved in this study were not dedicated military facilities with highly trained trauma or cardiothoracic surgeons, but staffed by general surgeons operating in an austere, lowresource, make-shift hospital settings. Also, the records reviewed were based on hand-written documentation later transposed into computer spread sheets, as there was no dedicated electronic medical record system available. Unfortunately, we were unable to accurately estimate blood loss and blood products for transfusion were in short supply. We were also unable to accurately report initial vital sign trends in the field as the patients were transported by paramedics with limited training who themselves were often under attack. During conflict situations and war, penetrating cardiac injury is a universally life threatening condition with a low survivability rate. These traumatic injuries require emergent intervention, aggressive patient stabilization, and readily available diagnostic studies such a portable bedside FAST ultrasound examination. Early operative intervention is the key element to survival. We retrospectively described 11 patients with PCI in two low resource field hospitals in Aleppo during the Syrian War over an 18-month period. In our case series, Syrian surgeons were optimally aided by diagnostic bedside FAST ultrasonography. Ten of eleven patients described in our series survived after lifesaving operative interventions featuring thoracotomies, rapid bleeding source identification and repair, with postoperative surgical intensive care monitoring. Training out of necessity and intense field experience for general surgeons during the Syrian war proved effective in rescuing patients with PCI who may have otherwise not survived. Mahmoud Hariri contributed to the concept, direct patient care, carried out data gathering and analysis as well as writing and review of the manuscript. Abdul Muti Aswad contributed to direct patient care, data gathering and review of the manuscript. Mohamed El Edrees contributed to direct patient care, data gathering and review of the manuscript. Yasser Abo Khamis contributed to direct patient care, data gathering and review of the manuscript. Hussam Aldien Dubies contributed to direct patient care, data gathering and review of the manuscript. Ahmed Osama contributed to direct patient care, data gathering and review of the manuscript. Timothy B Erickson carried out data analysis, literature search and review, writing, editing, and senior author oversight of the manuscript. All authors read and approved the final manuscript. Janati M, Bolandparvaz S, Salaminia S, et al. Outcome of penetrating cardiac injuries in southern Iran, Shiraz. Chin J Traumatol. 2013;16(2):89-93. Kalijusto ML, Skaga NO, Pillgram-Larsen J, et al. Survival predictor for penetrating cardiac injury; a 10-year consecutive cohort from a Scandinavian trauma center. Scand J Trauma Resusc Emerg Med. 2015;23:41-48. Mishra B, Gupta A, Sagar S, et al. Traumatic cardiac injury: experience from a level-1 trauma center. Chin J Traumatol. 2016;19(6):333-336. Bland EF, Beebe G. Missiles in the heart. A twenty-year follow-up reported in World War II cases. N Engl J Med. 1966;274(19):1039-1046. Rich NM, Rhee P. An historical tour of vascular injury management: from its inception to the new millennium. Surg Clin North Am. 2001;81(6):1199-1215. Hata KW, Propper B, Rich N. Fifty-year anniversary of the Vietnam Vascular Registry and a historic look at vascular registries. J Vasc Surg. 2017;65(1):267-270. Asensio JA, Soto SN, Forno W, et al. Penetrating cardiac injuries: A complex challenge. Injury. 2001;32(7):533-543. Ramasamy A, Harrison SE, Stewart MP, et al. Penetrating missile injuries during the Iraqi insurgency. Ann R Coll Surg Engl. 2009;91(7):551-558. Zakharia AT. Thoracic battle injuries in the Lebanon War: Review of the early operative approach in 1,992 patients. Ann Thorac Surg. 1985;40(3):209-213. Dominguez F, Beekley AC, Huffer LL, et al. High-velocity penetrating thoracic trauma with suspected cardiac involvement in combat support hospital. Gen Thorac Cardiovasc Surg. 2011;59(8):547-52. Ezzine SB, Bouassida M, Benali M, et al. Management of penetrating cardiac injuries in the department of surgery, Mohamed Thahar Maamouri Hospital, Tunisia: report of 19 cases. Pan Afr Med J. 2012;11:54. Kremer H, Wilson J. Penetrating cardiac injury with urgent not emergent thoracotomy. Mo Med. 2010;107(5):328-330. Feliciano DV, Bitondo CG, Mattox KL, et al. Civilian trauma in the 1980s: A 1 year experience with 456 vascular and cardiac injuries. Ann Surg. 1984;199(6):717-724. Clarke DL, Quazi MA, Reddy K, et al. Emergency operation for penetrating thoracic trauma in a metropolitan surgical service in South Africa. J Thorac Cardiovasc Surg. 2011;142(3):563-568. Canoves J, Mainar L, Chorro FJ, et al. The assessment of cardiac involvement in a case of a thoracic injury from a firearm. Rev Esp Cardiol. 1997;50(10):729-32. Quinn AC, Sinert R. What is the utility of the focused assessment with sonography in trauma (FAST) exam in penetrating torso trauma? Injury. 2011;42(5):482-487. Boulanger BR, Kearney PA, Tsuei B, et al. The routine use of sonography in penetrating torso injury is beneficial. J Trauma. 2001;51(2):320-325. Hall MK, Omer T, Moore CL, et al. Cost-effectiveness of the cardiac component of the focused assessment of sonography in trauma examination in blunt trauma. Acad Emerg Med. 2016;23(4):415-423. Doss, M, Woehlecke T, Wood J, et al. The clamshell approach for the treatment of extensive thoracic aortic disease. J Thorac Cardiovasc Surg. 2003;123(3);814-817. Almehmadi F, Chandy M, Connelly KA, et al. Delayed tamponade after traumatic wound with left ventricular compression. Case Rep Cardiol. 2016;2154748. Rew DA, Clasper J, Kerr G. Surgical workload from an integrated UK filed hospital during the 2003 gulf conflict. J R Army Med Corps. 2004;150(2):99-106. Ramasamy A, Hinsley DE, Edwards DS, et al. Skill sets and competencies for the modern military surgeon: lessons from UK military operations in Southern Afghanistan. Injury. 2010;41(5):453-459.